The diagnosis of posterior instability is often delayed or even missed due to the relatively uncommon incidence and vague clinical presentation . Posterior instability incorporates a broad spectrum of pathology that may involve both soft tissue and bony architecture, making surgical management technically challenging. It is critical for the surgeon to accurately identify the nature of instability, as well as have a clear understanding of the anatomy and biomechanics, to achieve a successful outcome. Surgical management for posterior instability, including new arthroscopic techniques, has evolved over the past several years with promising results. Posterior shoulder instability can be classified by direction, degree, cause, and volition. The degree of posterior instability can range from mild subluxation to fixed dislocation. Recurrent posterior subluxations are more common than true posterior dislocations. Acute posterior dislocations typically occur from a direct force to the anterior shoulder or an indirect force with the arm in forward flexion, adduction, and internal rotation . Indirect causes for posterior dislocation include seizure and near electrocution. Recurrent posterior subluxation may result from repetitive microtrauma to the posterior capsule without a specific traumatic event. Overhead athletes (throwers or tennis players), swimmers, and golfers may develop pain associated with attenuation of posterior capsule, but instability is not a predominant symptom [3, 4]. Habitual voluntary dislocators may subluxate or dislocate upon command and these patients are often best treated nonoperatively. Conversely, non-habitual voluntary dislocators may respond well to surgery . The most common chief complaints in patients with posterior instability are pain, weakness, and a decrease in athletic performance [4, 6, 7]. The physician must determine the specific activity and timing of symptoms to make an accurate diagnosis. Overhead athletes often report a decrease in throwing velocity and pain that increases with prolonged activity, when muscle fatigue can compromise dynamic stability. Posterior shoulder instability should be ruled out in any young athlete with non-specific symptoms and a history to support the potential injury . A basic surgical history will also provide insight into the number and type of prior surgeries the patient has undergone to address instability. Consideration must be given to confounding variables or comorbidities such as Ehlers-Danlos syndrome, multi-directional instability (MDI), and Workers’ Compensation claims, which may impact the clinical outcome. Although ROM may be normal and symmetric, tenderness to palpation along the posterior glenohumeral joint line is common . Scapular winging can be a compensatory finding in patients with posterior instability. A winged scapula increases the bony stability posteriorly by anteverting the glenoid . The key to diagnosis is a reproduction of instability symptoms or positive apprehension during examination, which may be confirmed with examination under anesthesia. It is also important to note that athletes commonly display different degrees of laxity between their dominant and non-dominant shoulders, and these findings should not be used to substantiate a suspected diagnosis of posterior instability . The jerk test, Kim test, and the load and shift test are among the common provocative maneuvers for posterior instability. The jerk test  is performed with the patient seated. The scapula is stabilized and the arm is flexed 90º and internally rotated. The elbow is flexed 90º and either pushed posteriorly while the shoulder girdle is being stabilized or pushed anteriorly to provide counter pressure. This will cause a posterior subluxation or dislocation of the glenohumeral joint. The arm is then extended the glenohumeral joint will reduce with a jerk. If a painful relocation is noted, the jerk test is positive. The Kim test  is performed with the patient seated, the arm in 90º of abduction, and the elbow in flexion. The examiner applies an axial and posterior directed force while elevating the patient’s arm to 45º. Pain with this maneuver indicates a posteroinferior labral lesion, which can contribute to posterior instability. When the jerk test and Kim test are combined, there is 97% sensitivity in detecting a posterior labral tear . The treating physician must be aware that patients with MDI of the shoulder may have increased translation with load and shift testing, a positive sulcus sign, and positive Jerk and Kim tests. Positive findings on multiple tests may indicate that capsular laxity is more global in nature. Patients with isolated posterior instability have reproducible symptoms with maneuvers that stress the posterior capsule and labrum, such as the posterior load and shift, jerk, and Kim tests. Other important considerations include assessment of prior incisions to determine the surgical approaches that have previously been utilized and careful assessment of neurovascular status. Rotator cuff testing is also a component of the physical exam, especially in the older patient population. Plain radiographs should include anteroposterior, scapular outlet, and axillary views to evaluate the posterior glenoid rim, as well as a reverse Hill-Sachs lesion on the anterior humeral head. Our institution prefers the glenoid profile views described by Bernaugeau et al to further assess for glenoid bone loss  (Figure 1). 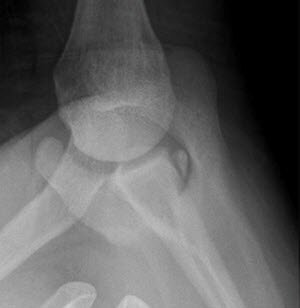 Radiographs should also be reviewed for associated fractures of the greater or lesser tuberosity, surgical neck, or humeral head, which can influence surgical management . Figure 1. Bernageau view of an offensive lineman with symptomatic recurrent posterior instability. Note the posterior glenoid rim fragment. Magnetic resonance arthrography (MRA) and magnetic resonance imaging (MRI) are the best modalities if the suspected diagnosis is related to soft tissue injury or if concurrent rotator cuff pathology is suspected. A recent study found that positioning the arm in flexion, adduction, and internal rotation during MRA improved the ability to exclude or characterize any posteroinferior labral pathology . Computed tomography (CT) can help delineate the size of a reverse Hill-Sachs lesion, the extent of deficiency to the posterior glenoid rim, and the degree of glenoid retroversion, which may be a factor in recurrent instability. In our practice, if any bony abnormality is suspected from plain films or physical exam findings, then a CT arthrography is the study of choice. The appropriate imaging coupled with a conclusive physical exam provides the best opportunity for accurate diagnosis and successful treatment. The initial treatment for posterior instability is non-surgical, with a trial of physical therapy and activity modification. Physical therapy programs focus on strengthening dynamic muscular stabilizers, with particular emphasis on scapular stabilizers to compensate for insufficient static stabilizers [17-19]. Non-surgical treatment with rehabilitation has been successful in up to 80% of patients with a history of atraumatic subluxation. Conversely, only 16% of patients with a traumatic subluxation had a successful outcome . Patients who demonstrate clear evidence of posterior labral tear are less responsive to non-operative treatment . An appropriate surgical candidate should still receive therapy initially to strengthen the dynamic stabilizers, which will help achieve optimal results in postoperative rehabilitation. Symptomatic posterior instability that fails conservative management is best managed with soft tissue procedures in the absence of glenoid fracture or bone loss. Specifically, arthroscopic techniques have advanced to become the gold standard for posterior instability without associated osseous deficiency (Figure 2). Figure 2. Posterior instability treated with arthroscopic capsulolabral repair. Posterior labral tear highlighted with probe (left), and final fixation (right). 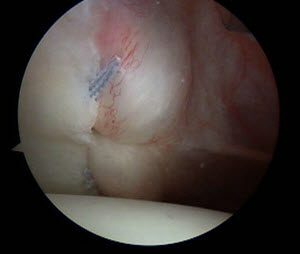 Although positive results have been shown with open posterior capsulolabral repair [21, 22], more recent studies using arthroscopic techniques have produced equal or better rates of success, [4, 23-25] with 90% of patients returning to sport . Arthroscopic techniques give the additional advantage of decreased soft tissue dissection as well as the ability to address any associated injury of the shoulder . Posterior instability in patients with glenoid fracture or bone loss requires glenoid augmentation with a bone block [27, 28]. Arthroscopic techniques have been described for placement of glenoid bone blocks [29, 30]; however, our preferred technique is an open procedure using autogenous iliac crest bone graft. We utilize two 4.0mm cannulated screws to secure the graft and augment with a capsular repair (Figure 3). Figure 3. Postoperative images of posterior instability treated with iliac-crest-bone block. Anteroposterior (left) and axillary (right) views of autogenous iliac crest bone block placement to the posterior glenoid. Pathologic conditions responsible for posterior shoulder instability can include variations in humeral and glenoid version, capsular laxity, labral injury, osseous deficiency, and lack of dynamic muscle control. MRI and MRA have improved the identification and extent of soft tissue injury. CT is helpful in evaluating potential bony deficiency that may be suspected. Successful surgical management depends on intraoperative assessment of labral integrity as well as the degree of capsular laxity or tearing. These findings should dictate the method of surgical repair and the extent of capsular plication. In the absence of a labral tear, the degree of posterior instability and capsular laxity can be underestimated and it is imperative to address with an appropriate capsular shift. We recommend using suture anchors for capsulolabral repair and capsulorrhaphy, as this has shown to have superior clinical outcomes in the absence of bony defects . Posterior deficiency of the glenoid has traditionally been treated with open augmentation. However, recent studies [29, 30] describe an arthroscopic bone grafting procedure with promising early clinical results. An open posterior bone block (autogenous iliac crest bone graft) procedure with medial capsular repair as necessary remains the treatment of choice in our practice . 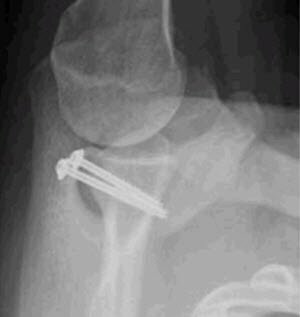 The preferred treatment for a large reverse Hill-Sachs lesion may be an osteoarticular allograft reconstruction, an anatomic shoulder arthroplasty , or a lesser tuberosity transfer (McLaughlin procedure) ; however, these are rarely indicated. Bony abnormalities such as severe humeral or glenoid retroversion are managed with osteotomy, but these are very rarely performed in our practice. Posterior instability is a spectrum of conditions that makes diagnosis challenging. The young athlete presenting with vague shoulder pain and decreased performance should be assessed for posterior instability. Successful treatment depends on selecting the appropriate procedure to address the pathology identified by physical examination and imaging findings. Arthroscopic surgery has become the first line treatment of soft tissue deficiency if conservative management is unsuccessful. Further advances in surgical technique and the understanding of glenohumeral biomechanics are still being made to improve patient outcomes. T. Bradley Edwards, MD, and Brent Morris, MD, are with the Fonden Orthopedic Group, Houston, Texas. Benjamin Szerlip, DO, is with the Austin Shoulder Institute, Austin, Texas. Hawkins RJ, Koppert G, Johnston G. Recurrent posterior instability (subluxation) of the shoulder. J Bone Joint Surg Am. 1984 Feb;66(2):169-74. Antoniou J, Duckworth DT, Harryman DT,2nd. Capsulolabral augmentation for the the management of posteroinferior instability of the shoulder. J Bone Joint Surg Am. 2000 Sep;82(9):1220-30. Faustin CM, El Rassi G, Toulson CE, Lin SK, McFarland EG. Isolated posterior labrum tear in a golfer: A case report. Am J Sports Med. 2007 Feb;35(2):312-5. Bradley JP, Baker CL,3rd, Kline AJ, Armfield DR, Chhabra A. Arthroscopic capsulolabral reconstruction for posterior instability of the shoulder: A prospective study of 100 shoulders. Am J Sports Med. 2006 Jul;34(7):1061-71. Fuchs B, Jost B, Gerber C. Posterior-inferior capsular shift for the treatment of recurrent, voluntary posterior subluxation of the shoulder. J Bone Joint Surg Am. 2000 Jan;82(1):16-25. Kim SH, Ha KI, Park JH, Kim YM, Lee YS, Lee JY, et al. 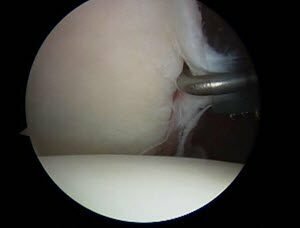 Arthroscopic posterior labral repair and capsular shift for traumatic unidirectional recurrent posterior subluxation of the shoulder. J Bone Joint Surg Am. 2003 Aug;85-A(8):1479-87. Robinson CM, Aderinto J. Recurrent posterior shoulder instability. J Bone Joint Surg Am. 2005 Apr;87(4):883-92. Provencher MT, LeClere LE, King S, McDonald LS, Frank RM, Mologne TS, et al. Posterior instability of the shoulder: Diagnosis and management. Am J Sports Med. 2011 Apr;39(4):874-86. Millett PJ, Clavert P, Hatch GF,3rd, Warner JJ. Recurrent posterior shoulder instability. J Am Acad Orthop Surg. 2006 Aug;14(8):464-76. Warner JJ, Navarro RA. Serratus anterior dysfunction. recognition and treatment. Clin Orthop Relat Res. 1998 Apr;(349)(349):139-48. Bahk M, Keyurapan E, Tasaki A, Sauers EL, McFarland EG. Laxity testing of the shoulder: A review. Am J Sports Med. 2007 Jan;35(1):131-44. Blasier RB, Soslowsky LJ, Malicky DM, Palmer ML. Posterior glenohumeral subluxation: Active and passive stabilization in a biomechanical model. J Bone Joint Surg Am. 1997 Mar;79(3):433-40. Kim SH, Park JS, Jeong WK, Shin SK. The kim test: A novel test for posteroinferior labral lesion of the shoulder–a comparison to the jerk test. Am J Sports Med. 2005 Aug;33(8):1188-92. Bernageau J, Patte D, Debeyre J, Ferrane J. Value of the glenoid profil in recurrent luxations of the shoulder. Rev Chir Orthop Reparatrice Appar Mot. 1976;62(2 suppl):142-7. Robinson CM, Akhtar A, Mitchell M, Beavis C. Complex posterior fracture-dislocation of the shoulder. epidemiology, injury patterns, and results of operative treatment. J Bone Joint Surg Am. 2007 Jul;89(7):1454-66. Chiavaras MM, Harish S, Burr J. MR arthrographic assessment of suspected posteroinferior labral lesions using flexion, adduction, and internal rotation positioning of the arm: Preliminary experience. Skeletal Radiol. 2010 May;39(5):481-8. Burkhead WZ Jr, Rockwood CA,Jr. Treatment of instability of the shoulder with an exercise program. J Bone Joint Surg Am. 1992 Jul;74(6):890-6. Illyes A, Kiss RM. Electromyographic analysis in patients with multidirectional shoulder instability during pull, forward punch, elevation and overhead throw. Knee Surg Sports Traumatol Arthrosc. 2007 May;15(5):624-31. Matias R, Pascoal AG. The unstable shoulder in arm elevation: A three-dimensional and electromyographic study in subjects with glenohumeral instability. Clin Biomech (Bristol, Avon). 2006;21 Suppl 1:S52-8. Provencher MT, Bell SJ, Menzel KA, Mologne TS. Arthroscopic treatment of posterior shoulder instability: Results in 33 patients. Am J Sports Med. 2005 Oct;33(10):1463-71. Rhee YG, Lee DH, Lim CT. Posterior capsulolabral reconstruction in posterior shoulder instability: Deltoid saving. J Shoulder Elbow Surg. 2005 Jul-Aug;14(4):355-60. Bottoni CR, Franks BR, Moore JH, DeBerardino TM, Taylor DC, Arciero RA. Operative stabilization of posterior shoulder instability. Am J Sports Med. 2005 Jul;33(7):996-1002. Williams RJ 3rd, Strickland S, Cohen M, Altchek DW, Warren RF. Arthroscopic repair for traumatic posterior shoulder instability. Am J Sports Med. 2003 Mar-Apr;31(2):203-9. Radkowski CA, Chhabra A, Baker CL,3rd, Tejwani SG, Bradley JP. Arthroscopic capsulolabral repair for posterior shoulder instability in throwing athletes compared with nonthrowing athletes. Am J Sports Med. 2008 Apr;36(4):693-9. Savoie FH 3rd, Holt MS, Field LD, Ramsey JR. Arthroscopic management of posterior instability: Evolution of technique and results. Arthroscopy. 2008 Apr;24(4):389-96. Bradley JP, McClincy MP, Arner JW, Tejwani SG. Arthroscopic capsulolabral reconstruction for posterior instability of the shoulder: A prospective study of 200 shoulders. Am J Sports Med. 2013 Sep;41(9):2005-14. Fronek J, Warren RF, Bowen M. Posterior subluxation of the glenohumeral joint. J Bone Joint Surg Am. 1989 Feb;71(2):205-16. Sirveaux F, Leroux J, Roche O, Gosselin O, De Gasperi M, Mole D. Surgical treatment of posterior instability of the shoulder joint using an iliac bone block or an acromial pediculated bone block: Outcome in eighteen patients. Rev Chir Orthop Reparatrice Appar Mot. 2004 Sep;90(5):411-9. Gupta AK, Chalmers PN, Klosterman E, Harris JD, Provencher MT, Romeo AA. Arthroscopic distal tibial allograft augmentation for posterior shoulder instability with glenoid bone loss. Arthrosc Tech. 2013 Oct 10;2(4):e405-11. Smith T, Goede F, Struck M, Wellmann M. Arthroscopic posterior shoulder stabilization with an iliac bone graft and capsular repair: A novel technique. Arthrosc Tech. 2012 Sep 24;1(2):e181-5. Servien E, Walch G, Cortes ZE, Edwards TB, O’Connor DP. Posterior bone block procedure for posterior shoulder instability. Knee Surg Sports Traumatol Arthrosc. 2007 Sep;15(9):1130-6. Wooten C, Klika B, Schleck CD, Harmsen WS, Sperling JW, Cofield RH. 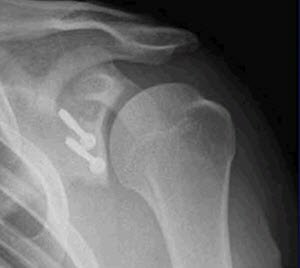 Anatomic shoulder arthroplasty as treatment for locked posterior dislocation of the shoulder. J Bone Joint Surg Am. 2014 Feb 5;96(3):e19. Hawkins RJ, Neer CS,2nd, Pianta RM, Mendoza FX. Locked posterior dislocation of the shoulder. J Bone Joint Surg Am. 1987 Jan;69(1):9-18. Next articleBiceps Management: Tenodesis or Tenotomy?